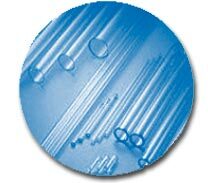 VitroCom's Vitrotubes(TM) (Hollow Round Capillaries) manufactured in Borosilicate glass with Inner Diameters (ID) from 0.05mm to 2.0mm. Also available in Clear Fused Quartz. Available in packs of 100mm, 300mm and 600mm lengths. Please select the length of capillaries required. Rectangle capillaries and Square capillaries are also available.